Ralph Kennedy Frasier, Jr., is one of the founding partners with Frasier & Griffin, PLLC, which is a successful legal practice with a proven track record serving clients all over North Carolina. Attorney Frasier has been in private practice since 1996 and is a skilled litigator who concentrates in criminal, traffic, wrongful death and personal injury law. Prior to forming Frasier & Griffin, Attorney Frasier practiced as an Associate attorney to his mentor Attorney “Butch” Williams at The Law Offices of James D. Williams, Jr., and the national law firm of Porter Wright Morris and Arthur, LLP in their Columbus, Ohio, office. Attorney Frasier earned his B.S. in Business Administration and Accounting from Hampton University and his Juris Doctor Degree from North Carolina Central University School of Law. He is admitted to practice in North Carolina State Court as well as the Middle and Eastern Federal District Courts of North Carolina. 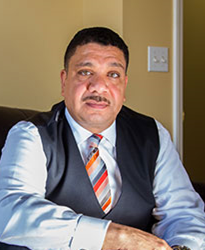 He is a member of the North Carolina State Bar, the North Carolina Bar Association, the National Association of Criminal Defense Lawyers, the 14th Judicial District Bar Association and the North Carolina Black Lawyers Association. Attorney Frasier has deep family ties to the region and as a result is proud to be an active member of the Durham County and Columbus County, NC, communities. Attorney Frasier serves on numerous community boards including the Board of Directors of The Boys and Girls Club of Greater Durham, the Durham Committee on the Affairs of Black People, the NCCU School of Law Alumni Association, the NCCU School of Law Board of Visitors and a Board Member of the Museum of Durham History. He has also served as an adjunct professor at NCCU School of Law. Attorney Frasier is also an advisor and investor in numerous small businesses and ventures throughout the region. Attorney Frasier is the proud father of two children, Lauren Kennedy Frasier-Jeffries and Ralph K. Frasier, III.